The color, history and durability of green jade have made it popular with both ladies and men. 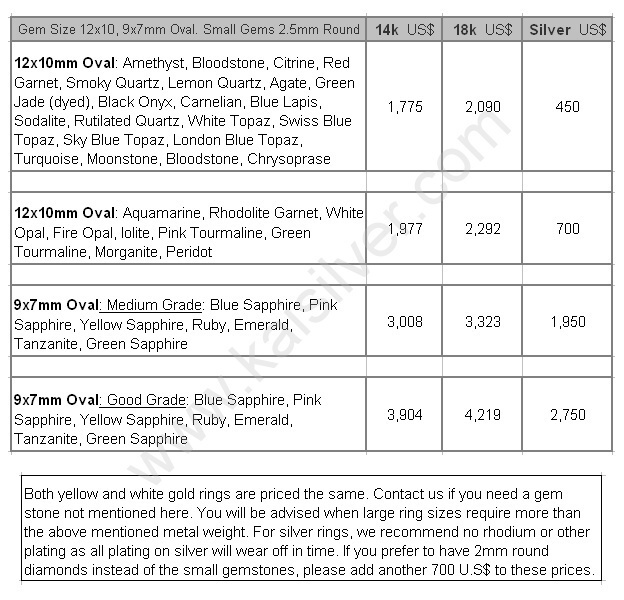 When evaluating men's jade gemstone rings, you will need to decide on a few parameters. The finest green jade is called Imperial Jade and it is mined in the northern Kachin region of Burma. This gem can be extremely expensive and even more so, when it comes to large sizes required for men's rings. So what then are the more affordable options available for men's jade rings with natural jade gems. Kaisilver custom makes all jewelry including men's rings with jade in gold or 925 sterling silver. We can custom make your men's ring with gemstones and designs of your choice, this ensures that the ring will always showcase all your preferences. Each jade gemstone ring is fully custom made with your design or ours. The same quality of workmanship and gems are provided for gold and 925 silver rings. Moderately priced natural jade from Burma is custom cut used in all rings. Both untreated or treated Burmese jade can be provided at affordable prices. High quality and Imperial Jadeite can be sourced on requests, these gems are expensive. Both gold and silver jade rings for men have good metal weight and durability. All ring sizes available since each ring is fully made to order. You can request for a name or short message to be etched inside the band of the ring. Treated Or Untreated Jade: Our men's green jade rings are crafted with moderately priced natural jade from Burma. 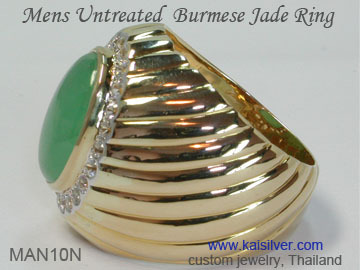 We source both treated and untreated natural Burmese jade at affordable price ranges. Dyed (treated) jade will show a very attractive color but, you need to understand that this natural jade is treated to enhance its beauty. Many knowledgeable gem and jewelry buyers, give much respect to natural and untreated gems. This is also true of jade lovers who wear the gem for its special powers and metaphysical properties. 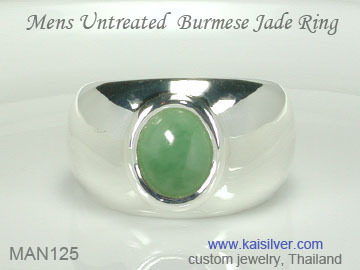 You can request for your men's jade gemstone ring to have an affordable untreated Burmese jade gem. All our jade jewelry will have a clear disclosure related to gem treatment. Fine green jade from Burma that is not treated commands a very high price and you can expect to pay around, 1,000 U.S$ to 2,500 U.S$ per carat for such gems. Email us if you need fine quality jade referred to as, Imperial Jade and we will source the gem for you. Kaisilver: We are the leading online custom made jewelry provider based in Thailand. Highly skilled artisans and gem cutters work on all our jewelry orders. We are fully equipped to craft all types of jewelry in gold or sterling silver with gemstones of your choice. You can email us your own design ideas or sketches or, pick from our selection. Since each jewel is completely made to order, we can accommodate all design change requirements. Few jewelers can match our expertise and reach when it comes to gem procurement. Directly networked to almost every gem mining center in the world and given preferential access to more than 200 million carats of cut and polished gemstones, we are in a position to place absolutely no restrictions on the gems that you can select. Get in touch with our experts at sales@kaisilver.com for any gem and jewelry related queries that you might have. A tremendous men's jade ring crafted in gold or sterling silver. The gemstone in this green jade ring is mined in Burma and is moderately priced. The gem as shown in the MAN125 ring image, is untreated but you could requested for a dyed jade gemstone for your ring. 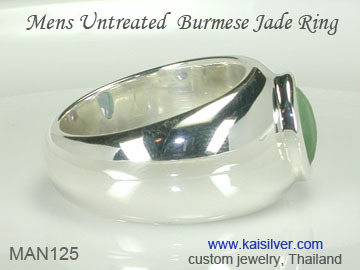 A jade ring for men with an untreated Burmese jade gem has special significance for knowledgeable jewelry lovers, almost 90% of all jade mined in Burma is treated to enhance its appearance. Jade has been known for thousands of years, special powers and qualities have been attributed to the gem. Many of you would wear a jade gemstone ring due to ancient traditions and customs, an untreated jade gemstone is generally considered to be better for you. A dyed jade gem would appear much prettier, fine colored jade that is untreated can be priced in the 1,000 U.S$ to 2,500 U.S$ per carat price range. Our mission is to get right into the Burmese jade mining region in Kachin and pick jade that looks good, is untreated and is not extravagantly priced. However we can procure and provide, dyed jade or fine Imperial Jade if that is what you need. Dyed jade has the ability to deliver a gorgeous green gem at an affordable price but, it is our duty to inform you that the gem is treated. You get the same quality of workmanship and gemstone for the gold or 925 silver men's jade ring. 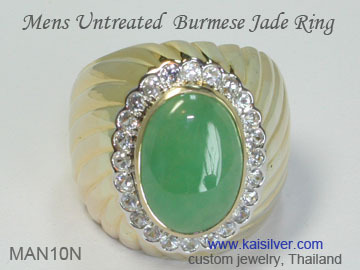 The center gem is a 11x9mm oval natural and untreated green jade gem from Burma. The stone as shown in the image is not dyed but, you can request for dyed jade at the same price. We can also procure and provide price quotes for high quality untreated Burmese jade, this quality is also referred to as Imperial Jade. The silver ring has a metal weight of around 15 to 20 grams. The gold men's jade ring weighs around 18 to 20 grams. If you require a very large gold ring size or prefer to leave the ring un-scooped inside the band, there could be a requirement for additional gold. Our team will let you know before order confirmation, it additional metal and costs would be involved. For the men's sterling silver jade ring, the requirement for a solid band with no metal scooping inside the band, can generally be accommodated without any additional charge. The portion behind the finger is around 6-7mm wide, the ring is designed and crafted to ensure long term durability. A big jade ring for men with a large 12x10mm oval untreated green jade gem from Burma. The MAN10N gents jade ring can be crafted in gold or 925 sterling silver. This men's ring is a bit more elaborate as compared to the MAN125 jade ring shown on this page. The big jade gem in the center is surrounded by 2.5mm round natural white sapphires. 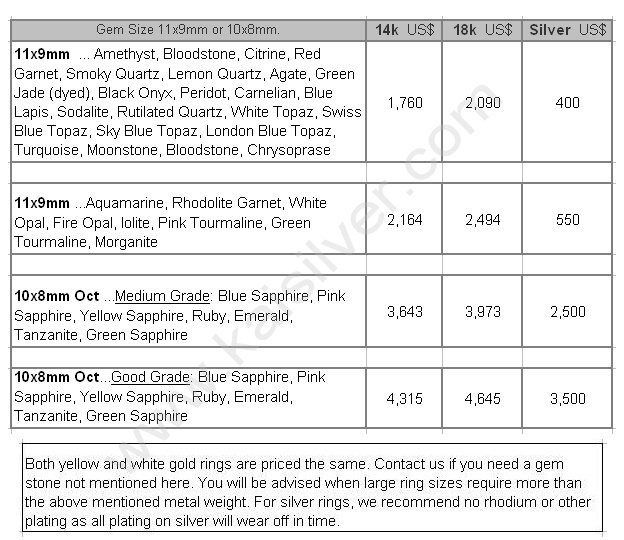 When you order the silver or gold jade men's ring, you can request for the white sapphires to be kept out of the design. Let us know if you would like to have some other gems instead of the white sapphires, around the center oval gem. The metal on this ring is given a ribbed effect design but, the same ring can also be made with a smooth high polish finish. As is the case with all Kaisilver custom rings, the MAN10N men's gemstone ring is available in all ring sizes. The band width of this MAN10N men's ring behind the finger is around 6-7mm. The men's 925 silver jade ring weighs around 15-20 grams and the gold ring, has a weight of approximately 18-22 grams. How To Buy: All the expertise of our support team is at your service, you need not make any purchase from us to get the benefit of their talent and experience. We encourage you to discuss your requirements with our team at sales@kaisilver.com . Remember that we can custom make your jade ring in gold or sterling silver with the design of your choice, so you can email us your own design ideas too. The production time is around 4 to 6 weeks from the date of order confirmation and receipt of payment. While Paypal and Western Union are our preferred modes of payment, we recommend Paypal for first time buyers. Let us know your choice of payment and we will provide details and instructions for the same. Your parcel will ship through FEDEX and can be tracked on the web. There is an additional charge to be added to the above prices to cover the cost of shipping. Add 35 U.S$ for shipping to the U.S, Australia, New Zealand and Japan. The cost of FEDEX shipping to most parts of Europe is 45 U.S$. You will be informed of the exact shipping charges once we have details of your location.